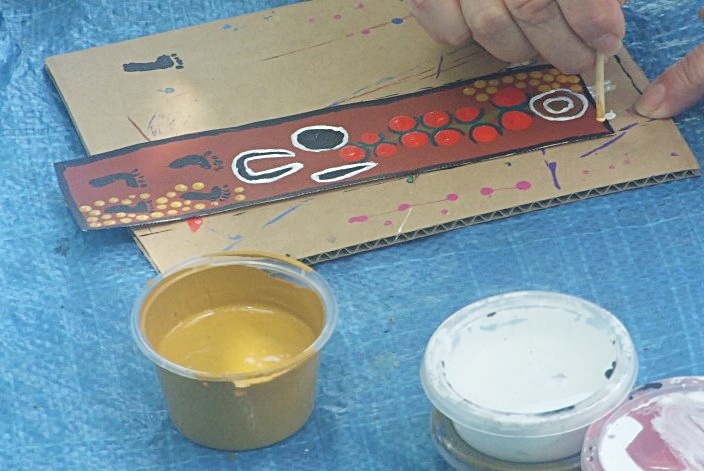 Aboriginal art is one of the oldest art forms known to man. This art form consists of symbols as a means of communication. These symbols stood for their lives, their rituals, their food and their customs. These works of art were used mostly in religious ceremonies. Aboriginal art focused on how the land was formed and consisted mainly of animals and patterns. The artists only used colours found in nature. Soil was red, brown or yellow. The Aboriginals created their works only on things that are found in nature; bark, logs, rocks and trees. The backgrounds were never blank; there was a sense of movement from the continuous use of dots and patterns in the work. Most Aboriginal art for kids was based on Dreamtime, the time that Aborigines believe that the world was created. These paintings are used to associate children with the traditions of the Aborigines in a different form than song or dance. These paintings usually revolve around the teaching of a moral. Since children learn from various methods, these paintings help convey the messages of the Aborigines to different aged children. Bark, one of the canvases that the Aborigines used, was not the best medium due to the inability of the bark not to rot and decay. Many of the original works have been destroyed because of this. These Dreamtime paintings can be dated back by about 50,000 years. Children, today, can still hear and see some of these stories told by the locals. The passing down from generation to generation has helped kept the culture of the Aborigines alive. This type of abstract art is being taught throughout the world; thereby, spreading not only the art but the culture of the Aborigines. The dots used in these painting are often used to hide a secret message. The people of the Aboriginal culture often thought that the white men were going to understand the message and then massacre them. The Australian government and the Aborigines had created camps whose specialty is to keep these traditions and lore alive. Children are taught a variety of skills that their ancestors learned. The most renowned children’s and adult’s cultural experience is held at Top Didj. In a 2 ½ hour session, visitors will be led by Manuel Pamkal. He will enthrall you with stories about his past, his painting style and how he lived off the land. Manuel will teach the participants the technique of Rarrk painting or cross hatch. The visitors can then paint their own mural to take home as a souvenir. Next on the agenda is fire lighting. No matches or lighters allowed. You will be shown how to light a fire by rubbing two sticks together while listening to the magical tale of those stick. Lastly, you will be shown how to throw a spear correctly. Manuel will give you the opportunity to hit the fake kangaroo target. You can then go explore the art gallery or visit the joey wallabies that are jumping around. Children need to experience their heritage through song, dance and art. They need to feel connected to other members of society and their place in history. Belonging to someplace brings a sense of pride to the child as they meet other member of different societies. Children and adults need to see, hear and participate in activities that foster the similarities and differences among people. The more you know about the past, the better able you are to handle the present and look forward to the future. great effort! I think Malaysian should do like this too! Oh wow. this is really interesting. Very interesting! Must say it is a good topic for blog post..
Our country should also promote these historically native arts. The young should recognize and be proud of our indigenous heritage.